Tess Bridgeman was an IILJ Scholar from 2007-2010. 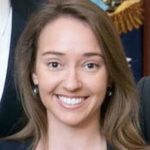 She most recently served as Special Assistant to the President, Associate Counsel to the President, and Deputy Legal Adviser to the National Security Council (NSC). She previously served at the Department of State in the Office of the Legal Adviser, in the Office of Political-Military Affairs and as Special Assistant to the Legal Adviser; clerked for Judge Thomas L. Ambro of the Third Circuit Court of Appeals; served at the Senate Judiciary Committee; and worked as a consultant for the World Bank Inspection Panel. Bridgeman also has a D.Phil. in International Relations from Oxford University, where she studied as a Rhodes Scholar.